So I've been wanting to do this great wall collage of black frames ever since I saw Rebecca's. (I totally ripped off one of your pictures - hope you don't mind!) She is so creative and crafty - just like I like to think I am. Doesn't it look great?! It's the combination of that earthy yellowish wall color with the black and white contrast that just speaks to me! I complimented her up and down about how great this wall looked in her house so she sent me a picture of her inspiration for the same project. Here it is, below. I found out later that it was from potterybarn.com. And who doesn't love Pottery Barn? They do everything good - just like Rebecca. I've had this stack of frames sitting next to the piano ever since we took down the Christmas tree. Remember all those frames on that tree? They looked so great up there I just couldn't part with them after the season. It turned out ok and I'm satisfied with it for now. But it will need some tweaking for sure. I'd forgotten that all of Rebecca's pictures were black and white (mental note #1). She also put up the same kind of wainscotting and moulding like the Pottery Barn picture (mental note #2 for Jeremy). And the contrast between the wall color and the frames is not what I wanted either (mental note #3 for Jeremy and me). The next project will be painting and I think I've finally nailed down a color - and there have been several attempts at finding one. Don't peek at the wall behind our drapes because there are about 8 different shades of "caramel" paint samples to choose from! It's called Bungalow Gold from Lowes. So whenever we get around to that project I'll post an update. My project execution would have been better had I paid attention to the details. For now, thank you Rebecca for your inspiration. 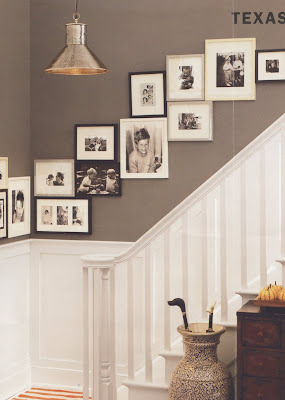 That is a really neat idea for a stairway collage. Thanks for sharing what you discovered in the learning process. The details do make a difference! Whatever, I love it! Just paint that hand rail black and call it done! It looks great, I think everything you do looks great though! I think it looks FAB, you're just getting thrown off by the wall color (or lack thereof).With a richer color it will look even better. I also love how you dealt with the light sconce making it part of the group- perfecto. And I wish I could take credit for the wainscotting, but it's just painted over ugly wood-look paneling from the 60's. No WAY would I even mess with installing sheets of paneling up stairs....YIKES. You collage looks AWESOME!! Now I'm feeling like I need a house with some stairs too. Actually, I have been trying to redo a collage of pics on my entry way wall. And I love how you arranged the bigger pics so that they touch and then filled in with the smaller pics. I think I will have to run with that idea and see what I come up with. I'll post once I finally get some time to actually finish it. Thanks for sharing. That is sooooo cool! I've been looking for some way to decorate with family photos, and you may have just given me a great idea! Too bad I don't have a wall like that on my staircase. Post your "tweeks" later and let us see the final results.